Kratkiye soobshcheniya Instituta arkheologii – KSIA (Brief Communications of the Institute of Archaeology). KSIA is an academic archaeological journal covering the whole of Russia. Its objective is to introduce into the academic literature the latest results of professional research and shape up-to-date concepts relating to problems of archaeology. The task of the journal is to publish the most important achievements of recent field archaeology and to examine a broad range of problems relating to pre-historic, Classical and Medieval archaeology (both in Russia and abroad) and using scientific methods in archaeology. The Editorial Board of the journal KSIA is constantly working to raise the academic level of the published materials, so as to provide readers with new relevant information concerning the achievements of archaeology in our country against a broad background of modern developments in the domain of historical research. When KSIA issues of are compiled, each one is focused on a particular theme and often based on materials from a recent conference organized by and held in the Institute of Archaeology Russian Academy of Sciences. 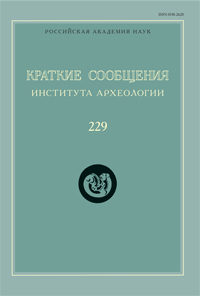 The journal “Kratkiye soobshcheniya Instituta arkheologii” – KSIA (Brief Communications of the Institute of Archaeology) has been coming out regularly since 1939. Its original title was “Brief Communications on Papers and Field Research from the Institute for the History of Material Culture” (KSIIMK). In 1960 (Issue 81) the name was changed, after the Institute for the History of Material Culture (IIMK) had been changed to the Institute of Archaeology, and after Issue 121 it was abridged. Publication resumed with Issue 211 in 2001 after an eight-year interval. At the present time it is brought out four times a year and covers archaeological work from all over the Russian Federation. KSIA is well-known not merely among professional archaeologists but also among specialists in prehistory, historians of the Ancient, Classical and Medieval periods, ethnographers, anthropologists, linguists and representatives of other academic disciplines. The journal is often quoted abroad as well. In 2010 and 2015 the Journal entered the List of leading peer-reviewed scientific journals and editions, recommended by The Higher certifying Commission. Russian Science Citation Index (RSCI) and RSCI core. At present the journal is brought out four times a year – March, June, September, December. The average number of pages in each issue is around 300. The journal is committed to the Open Access principle, i.e. users have the right “to read, download, copy, disseminate, search or make references to full texts of the papers published in the KSIA”.